recipe with us just in time for pear season! What’s better than a fantastic cocktail with cheese, fruit, spreads, olive, and crackers? Now onto this fabulous drink. To start, we have first to make our simple pear syrup; start by dicing an entire pear and throw it in a pot with 1 cup of sugar and 1 cup of water. Give the mixture a good stir and let it come to a boil. Make sure the sugar completely dissolves before removing the syrup from heat. Allow the pears to steep in the simply syrup while it cools completely. Next rim the glass with gold sugar….I got lucky and found some gold sanding sugar on Amazon. I’m sure you could find it at party city or your local store. To rim my glass, I dipped the tip of the champagne flute into the simple syrup and then the gold sanding sugar. Add the ice, vodka, and Pear simple syrutona shaker and shake away! Pour over diced pears and top with champagne. Yes it’s that easy ???? This drink is super easy and has just the right amount of glam! Make sure to sip responsibly because it’s a little on the strong side. What do you do to get in the mood during award shows? Do you play games, make delicious cocktails, charcuterie boards or all of the above lol. Let me know in the comments below! 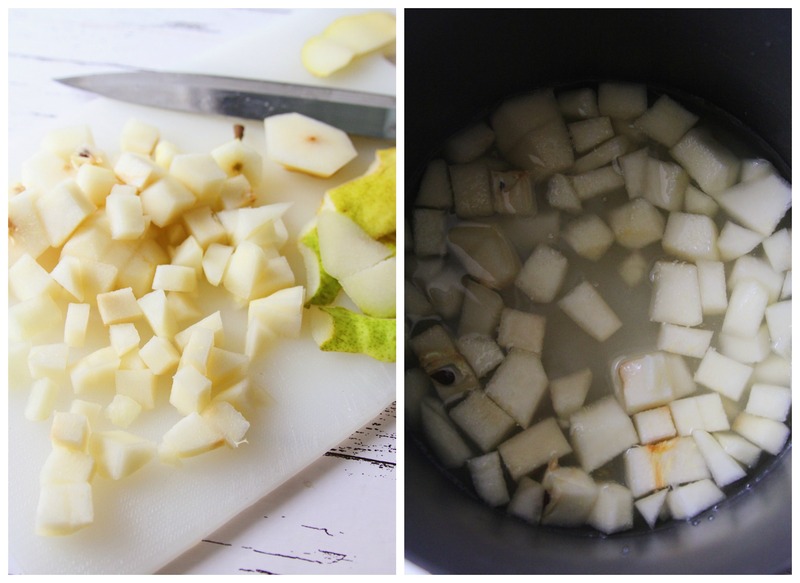 Dice pear and add to a saucepan with sugar and water; mix well and allow mixture to come to a boil. Once the sugar dissolves remove from heat and allow to cool while the diced pears steep in the syrup. 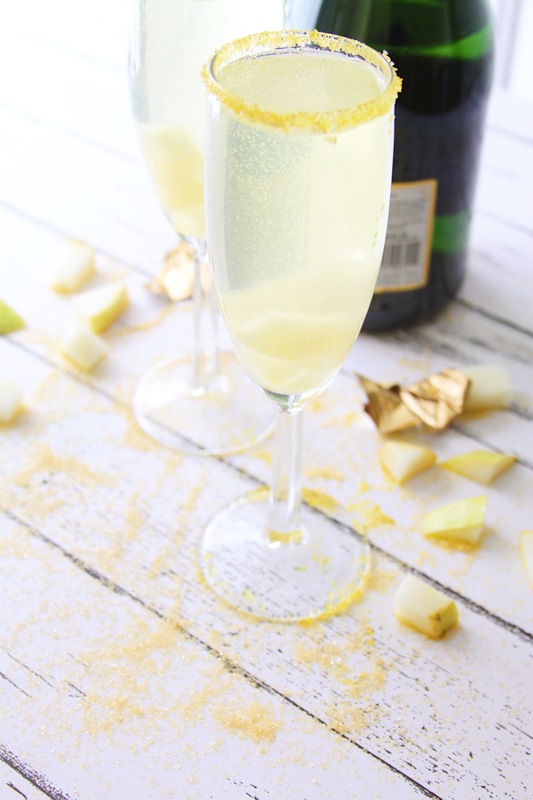 Dip the rims of your champagne flute into the simple syrup and in the gold sanding sugar; add pears from the simple syrup to the bottom of the champagne flute. Add ice, vodka, and simple syrup to a shaker and shake it until the shaker becomes cold to touch. 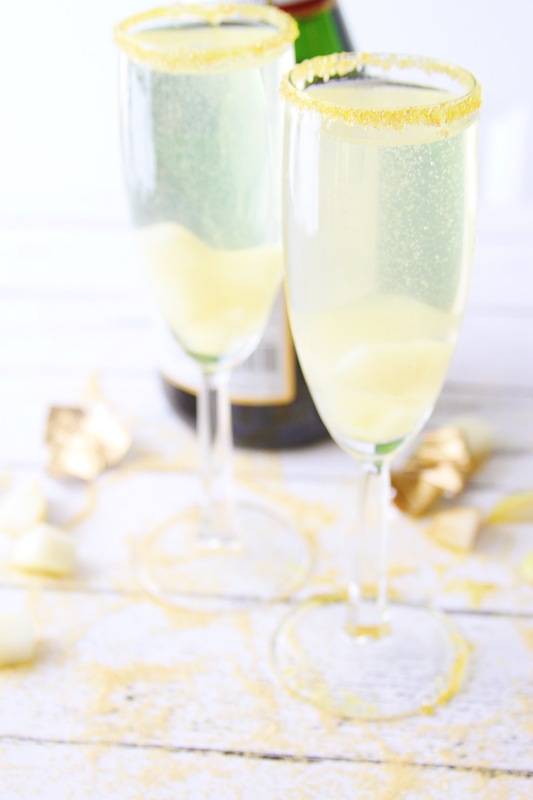 Distribute the mixture evenly between both glasses and top with champagne.